Rob Deering is a comedian and presenter. 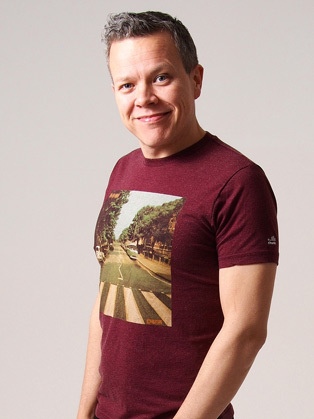 He is a former BBC New Comedy Award finalist and regularly hosts The Comedy Club (BBC Radio 4 Extra). He has appeared on Pointless Celebrities (BBC One), Celebrity Eggheads (BBC Two) and Celebrity Mastermind (BBC One). He also won a special comedian’s edition of The Weakest Link – Rob is the only person ever to have won without getting a question wrong! Rob is a regular contributor to Steve Lamacq’s Roundtable (BBC Radio 6 Music). His other credits include Comedy Rocks With Jason Manford (ITV) and Celebrity Juice (ITV2) as well as co-hosting Out To Lunch (BBC Radio 2) with Russell Kane. Rob has toured the UK with his critically-acclaimed solo shows. He is also a regular performer at the Edinburgh Fringe as well as appearing at the Udderbelly Festival (on London’s Southbank), Machfest, V Festival, Towersey Festival, Kendal Calling, Green Man Festival, Camp Bestival and Latitude. Also, his late-night music comedy pop quiz Beat This is a festival institution. Rob is in high demand both as a corporate performer and as a headliner at comedy clubs around the country and abroad. Rob is a prolific runner – he has completed multiple marathons and has a regular podcast, Running Commentary, with fellow comedian Paul Tonkinson in which they talk about life, and running, as well as interviewing celebrities and other interesting characters…all whilst running.